The 1925 version of The Lost World is far too massive and interesting to properly sum up in a single article. For the complete story - from preproduction to modern restoration - read the chapters presented here! The very first version of The Lost World was not the 1925 film, but an unrealized concept by film pioneer William Selig! A history of dinosaur films, from the birth of motion pictures up to the release of The Lost World. A biography of this SFX pioneer. O'Bie's right hand man and sculptor for The Lost World. In 1922, Sir Arthur Conan Doyle astounded the Society of American Magicians with some mysterious footage of living dinosaurs! The cut sequence involving cannibals and mutiny! Also some "behind the scenes" details of the scriptwriter's troubles! The trials and tribulations of stop-motion animation and live-action filming, including the human and animal casts. Advertisements and merchandise cross-promotions that announced the new spectacle picture to an awaiting public. Vintage reviews and other news from the film's screenings worldwide! How the film was cut and trimmed after 1925, and how it was restored in the 1990s. Also includes other aspects of The Lost World's legacy. 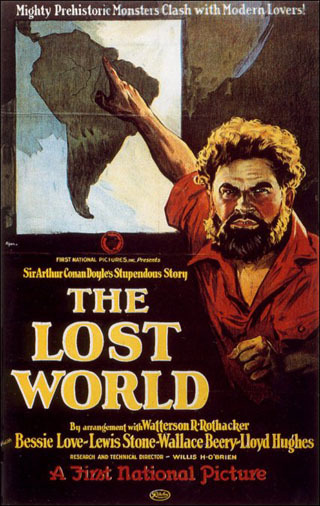 The Lost World was first in a long string of jungle adventure movies during the 20's, 30's and 40's. The hour-long Kodascope version of The Lost World.